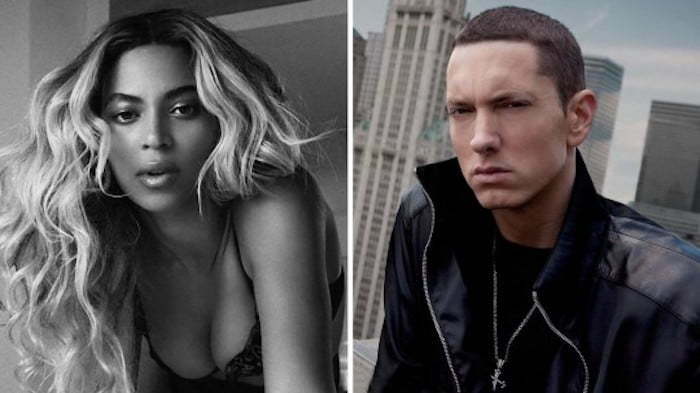 Eminem taps Beyonce for his new song “Walk On Water” the first off his upcoming album Revival. It’s been four long years since Eminem last released an album so everyone hip hop fans attention is laser focused on him. The album is rumored to be arriving on November 17 and the next day Em will be performing on “Saturday Night Live.” On this new single “Walk On Water,” Beyonce provides an angelic hook while Slim Shady delivered three killer verses. “I walk on water / But I ain’t no Jesus / I walk on water / But only when it freezes,” Queen Bey sings. Eminem raps about his struggles to live up to the expectations from his fans who views him as one of the greatest rappers of all time. “It’s the curse of the standard / That the first of the Mathers disk set / Always in search of the verse that I haven’t spit yet / Will this step just be another misstep / To tarnish whatever the legacy, love or respect I’ve garnered? / The rhyme has to be perfect, the delivery flawless,” Em raps. Eminem also heep some praises on to some his his rap peers both living and dead including Notorious B.I.G., Tupac, Nas, LL Cool J, Rakim, and the late pop icon Prince. “Walk On Water” is the first single off Shady’s new album Revival, arriving next week. Eminem will be performing on MTV EMA on Sunday, November 12 and he will be on SNL a week later. His new single “Walk On Water” is currently available on iTunes/Apple Music. Em has been teasing his upcoming project over the past two weeks with some mysterious ads about drugs. Revival will be the followup to Eminem’s 2013 classic album The Marshall Mathers LP 2. The Detroit rapper hasn’t released any new music since dropping that project.